What Should You Look For While Buying A Bedsheet? What does your bed sheet mean to you? It is that one thing that you set right in the first few minutes of your waking hours in the morning; and also, the last thing that you lay your hands upon to make it crease free before finally calling it a day. The one thing that is the crux of all comforts inside your house, without which your house completely loses its character – is none other than your bed sheet. A bed sheet is also not just about the comfort – it is something that gives your rooms a distinct identity that essentially reflects upon the refinement of your taste. If you set out to buy home furnishing products, you will be spoilt for choice. 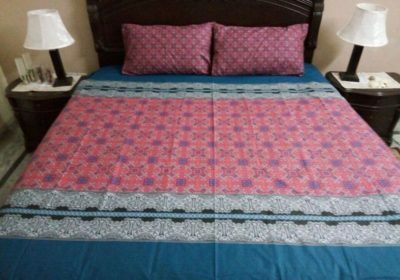 There are umpteen variety of bed sheets available in the market – right from printed to embroidered to mirror work to even special mosquito repellent ones. Bed sheets are not just functional pieces of fabric that are used to cover the mattress of your bed. They lend a distinct character to the room where they are spread in. A bed sheet can completely change the look and feel of the entire room. However, while we are talking about the look of it, we certainly cannot ignore the functional part when it comes to buying a bed sheet. So moving on to the quality of the bed sheet, going by the thumb rule the quality of a bed sheet is determined by its thread count. However, there are other factors such as fiber, weave and finish also plays an important role in imparting the quality of the bed sheet. Fiber – In terms of fiber, the most popular choice is a cotton-polyester mix which makes it crease free, durable and less expensive as compared to the pure cotton variants. People who like to use pure cotton bed sheets love the softness and easy to clean quality of the natural fabric. Weave – In terms of weaves the satin finish happens to be the most popular choice among the customers as compared to the plain weaves because of the velvety look and feel it imparts. These are best for merely the show of it while weaves such as jacquards, damask render a more textured look and coarser feel. Finish – As a practice, bed sheets are chemically treated to avoid shrinking, wrinkling and loosing shape. However, these days, more and more eco-friendly practices are being employed by the bed sheet manufacturers who are coming up with for a pure-finish bed sheets that are completely bereft of any chemical usage. Designer Bed sheet suppliers in India are also making their merchandise available online in order to reach out to the largest possible customer base who can buy bed sheets from any corner of the country. « How To Maintain Your AC For Longer Time?